Engine 20 is a 2017 Seagrave Marauder II with a 6-man full tilt cab and a stainless steel body. It has a 1250 GPM Waterous Fire Pump with a 750 gallon water tank. Engine 20 carries 2500′ of 3-1/2″ supply hose, 350′ of 2-1/2″ attack hose, 500′ of 1-3/4″ attack hose, and 450′ of 1″ attack hose. It also carries 300′ of 1″ booster line as well as a portable water monitor Engine 20 is 1st out on all calls involving a structure (fire alarms, building fires, gas leaks inside, & carbon monoxide), in our local, and 2nd out on all mutual aide calls involving a structure. 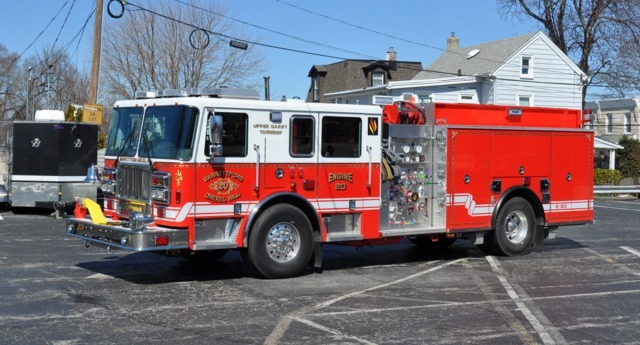 Engine 20-1 is a 2011 Seagrave Marauder II with a 6-man full tilt cab and a stainless steel body. It has a 1250 GPM Waterous Fire Pump with a 750 gallon water tank. It’s equipped with a 10kw electric generator supplying (2) 1000 watt scene flood lights, numerous 110 volt receptacles, and a 200′ hot cord reel. 20-1 carries 2500′ of 3-1/2″ supply hose, 350′ of 2-1/2″ attack hose, 500′ of 1-3/4″ attack hose, and 450′ of 1″ attack hose. It also carries 300′ of 1″ booster line as well as a portable water monitor. It carries an assortment of hand tools used by firefighters including: forcible entry tools, ventilation tools, electric powered ventilation fans, and various hose adapters. 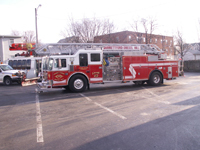 Ladder 20 is a 1996 Seagrave ladder truck. This truck is equipped with a 1250 GPM pump and a 350-gallon water tank. It also has a 100′ aerial ladder with a pre-piped water way. Ladder 20 can carry up to six firefighters. It carries 500′ of 3 ½” supply line and 350′ of attack lines. It can act as either an engine or a ladder truck or both at a fire scene. This truck also carries numerous forcible entry tools, 2 electric ventilation fans, 3 ventilation saws and numerous types and sizes of rope. Ladder 20 is our 3rd out piece of apparatus for structures in our district and responds 1st on mutual aide responses within Upper Darby Township. 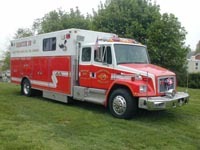 Rescue 20 is a 1997 PL Custom rescue truck on a Freightliner chassis. It is used for fire ground support activities as well as all types of rescues. Rescue 20 can carry up to 10 firefighters. This truck carries 2 full sets of the Hurst “Jaws of Life”, which are used for vehicle extrications as well as other types of rescues, As well as numerous hand tools used for rescues, and 4 “highlift” jacks, and assorted size and length ropes. It also carries numerous firefighting tools and electric lights. There is also a command post area in the back of the truck. Rescue 20 responds to all vehicle accidents with entrapment in Upper Darby Township. Rescue 20 is also first out for other type of rescue calls in our district and 4th out for fire calls. Rescue 20 was purchased and is owned by the Garrettford Drexel Hill Fire Company. Chief 20 is a 2018 Ford Expeditions which was bought in 2018 by the fire company. It is equipped with a full package of LED warning lights, a command center, and various small hand tools. 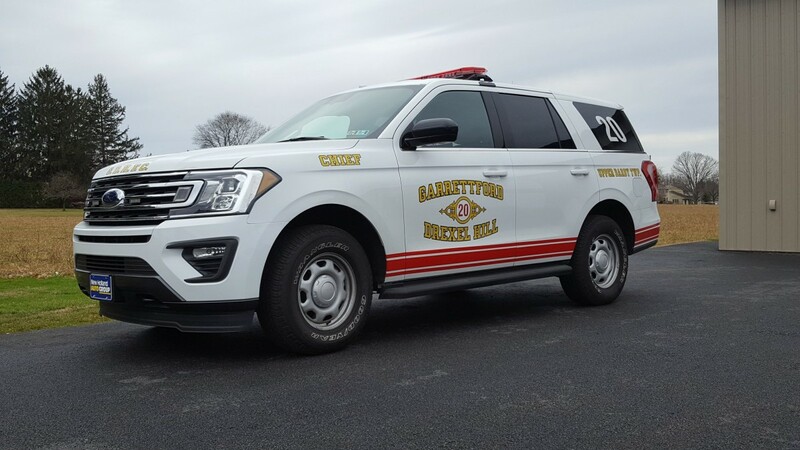 It is used by Chief of the Garrettford-Drexel Hill Volunteer Fire Company, to respond to all fire calls within Upper Darby Township and the surrounding mutual aid towns. Traffic 20 is a 1995 Jeep Cherokee. It was bought in 1995 by the fire company to be utilized as the Chief’s vehicle. It has since been converted to a traffic control unit and is utilized by the 8th District Fire Police. Traffic 20 carries an assortment of traffic control devices such as cones, flares, flashlights, & fire police attire. Traffic 20 is also used by the fire company as a manpower transport unit.